The Evinrude I-Command 3.5-inch gauges have a hidden option for a power-on self test (or POST) mode. POST mode is invoked at initial power on by holding down the DOWN button before applying power to the gauge. When the DOWN button is held as power is applied, the I-Command gauge will first show an Evinrude splash screen, then divert normal boot-up into the power-on self test (POST) mode. 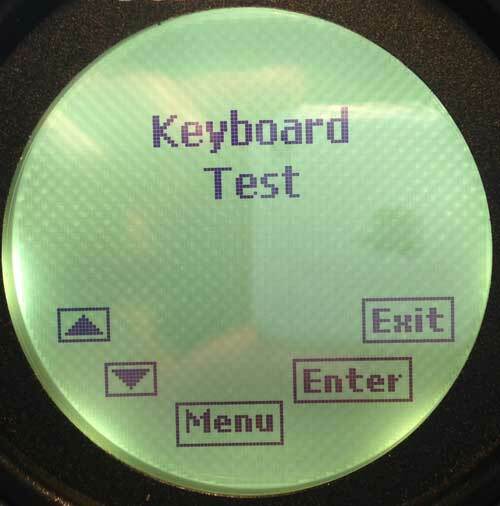 The KEYBOARD TEST screen appears and contains a presentation of five icons that represent the five buttons on the gauge: UP, DOWN, MENU, ENTER, and EXIT. You can depress the UP, DOWN, MENU, and EXIT buttons, and the associated icon will change to reversed black-white to indicate the button function is working. If you depress the PAGES/ENTER button, the self test branches to the next test screen, if the button is working. The CONTRAST ADJUST screen appears and allows adjustment of contrast. The UP and DOWN buttons are active and control the screen contrast. 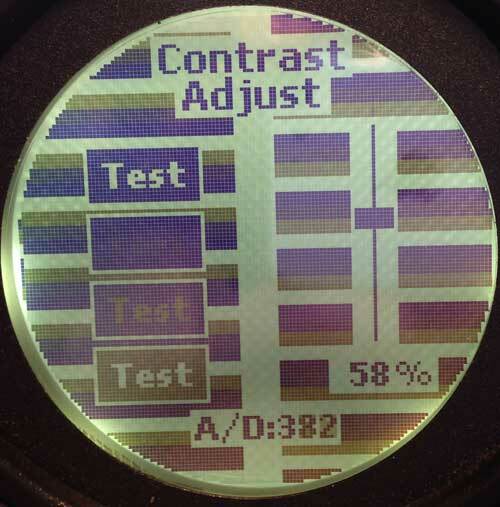 A field at the lower right shows the contrast setting as a percentage, from 0 to 100. A setting around 50 to 60 gave good viewing on my I-Command gauge. Another field at the lower center shows "A/D:nnn" with rapidly changing values of about 340 to 355. Depressing the EXIT button changes the background pattern. Successive presses of the EXIT button step through different background patterns. Depressing the PAGES/ENTER button exits this test screen to the next one. 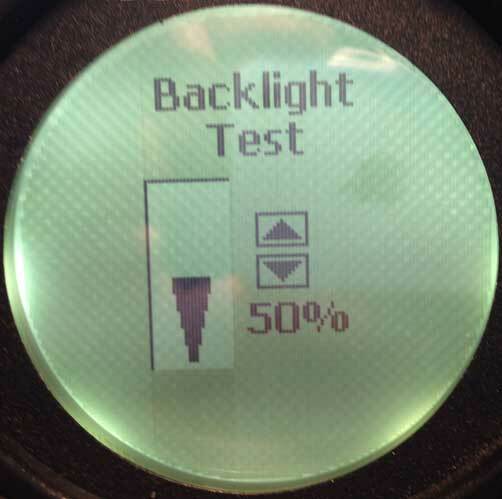 The BACKLIGHT TEST screen appears and allows adjustment of the gauge backlight level. Depressing UP and DOWN buttons moves the backlight value through a range of 0 to 100-percent. EXIT and MENU buttons cause no action. Depressing PAGES/ENTER exits this test screen to the next one. 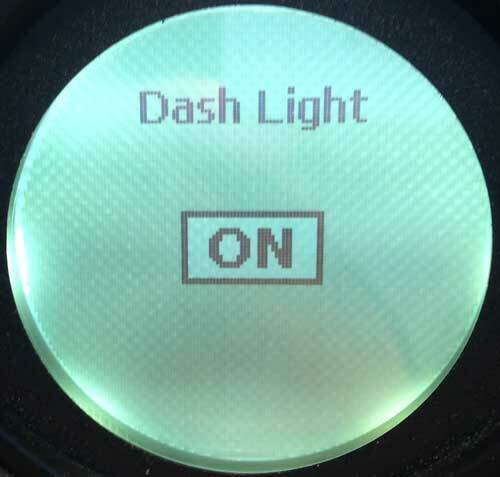 The DASH LIGHT screen appears and shows the status of the dash light circuit. If an external gauge illumination circuit has been connected to the gauge (by white wire to switched 12-Volt positive and black wire to negative) the Dash Light status will change to ON when the circuit is energized, and OFF when the circuit is not energized. (This wiring is optional and provides a method to control gauge illumination with an external switched circuit.) Pressing EXIT and MENU buttons cause no action. Depressing PAGES/ENTER exits this test screen to the next one. 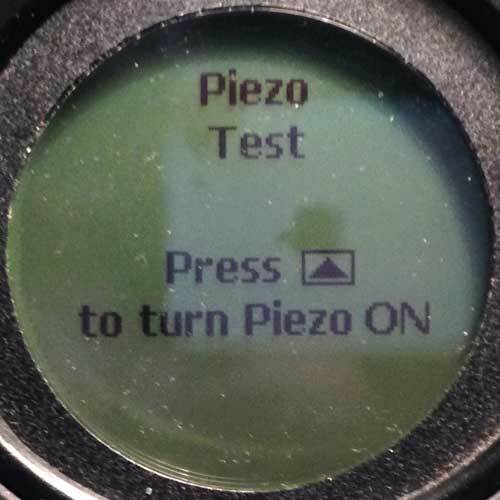 The PIEZO TEST screen appears and instructs to "Press [the UP button] to turn Piezo ON." If the UP button is pressed, the attached piezo aural alert sounds continuously, and the screen instruction changes to instruct "Press [the DOWN button] to turn Piezo OFF." Pressing EXIT and MENU buttons cause no action. Depressing PAGES/ENTER exits this test screen to the next one. 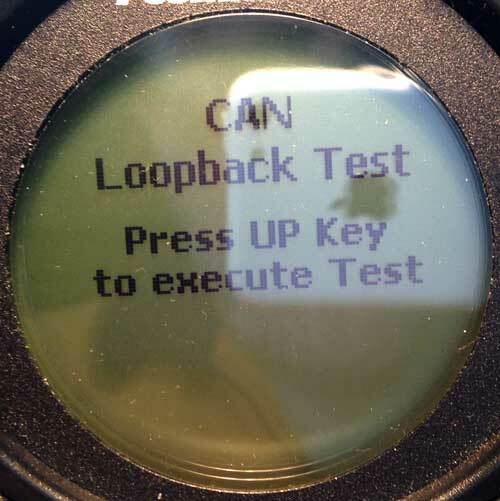 The CAN LOOPBACK TEST screen appears and instructs to "Press [the UP button] Key to execute Test." 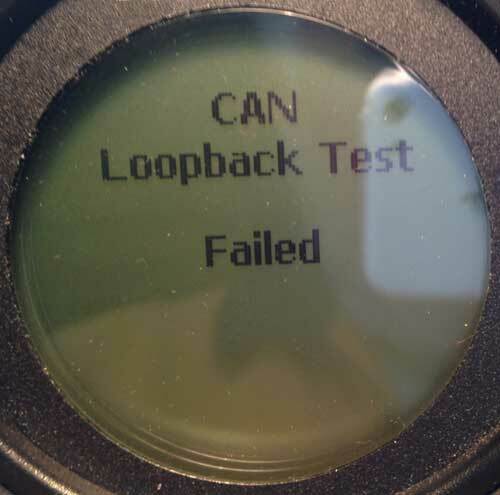 In my bench test with the I-Command gauge connected to a network without any other devices, the CAN loopback test result was "CAN Loopback Test Failed." I presume the test must need the E-TEC engine to be on the network to succeed. Depressing PAGES/ENTER exits this test screen to the next one. 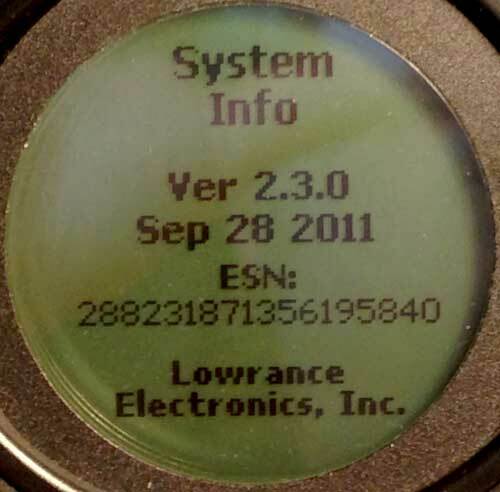 The SYSTEM INFO page appears and gives the firmware version, the date of the firmware, and the ESN of the gauge. In my instance, the data was: Ver. 2.3.o, Sep 28 2011, ESN 288231871356195840. Depressing PAGES/ENTER exits this test screen to the next one. 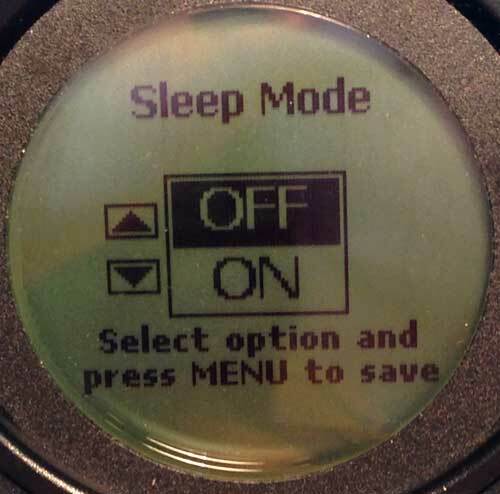 The SLEEP MODE page appears and offers a selection choice of OFF or ON. The screen instructs to "Select option and press MENU to save." Depressing PAGES/ENTER exits this test screen to the next one. This is the lasts page in the rotation and the next page return to the KEYBOARD TEST. You can cycle through all the test pages by pressing the PAGES/ENTER button. To exit the POST mode, remove power from the I-Command gauge. Reapply power without hold down any buttons. Note that holding down buttons other than the DOWN button at power-on also causes the normal boot-up of the gauge to be suspended. If the UP button is held at power-on, the normal boot-up is interrupted and only a blank screen appears. If the DOWN button is held at power-on, the POST mode is entered, as described in detail above. If the MENU button is held at power-on, the gauge boot-up immediately branches to the BOAT SETUP procedure. See the operating guide for details of the set-up procedure. If the PAGES/ENTER button is held at power-on, the gauge boot-up immediately branches to the BOAT SETUP procedure and prompts for the number of engines. See the operating guide for details of the set-up procedure. If the EXIT button is held at power-on, the gauge boot-up is interrupted and a MESSAGE screen appears. 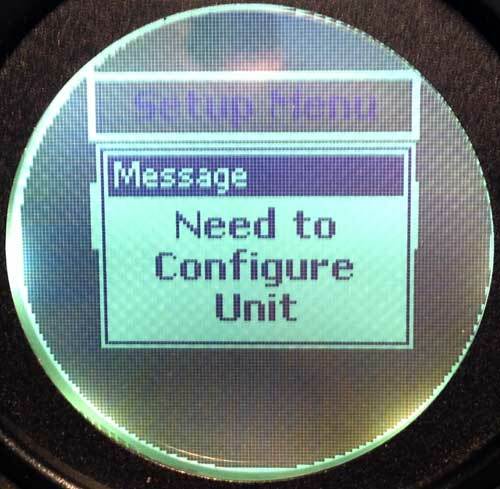 For an unconfigured gauge the message says "Need to Configure Unit." More messages may be possible. CAUTION: if you cause the I-Command gauge to branch into POST mode at power-on, the gauge also resets to factory defaults, and the entire set-up of the gauge must be re-done when the gauge is next allowed to boot into its normal mode. I-Command 2-inch gauges also have a power on self test; the POST is invoked by holding down the UP button when the gauge is powered on. I don't have a smaller gauge to experiment with, so I can't provide details about the options available in the POST.